Here is a very inexpensive water filter experiment I conducted over the past weekend. I was taught this method while serving in the military several years ago and remember it being one of the easiest and most simple methods I know of. All you need for this is two containers and a 1 foot piece of string, cord, or strip of cloth. Simply place the container of muddy/dirty water at an elevation slightly higher than the clean, empty container. Holding on to one end of the string, dip it into the container of dirty water, but ensuring not to allow the end you are holding onto to be submerged completely. Then run the string into the clean container. 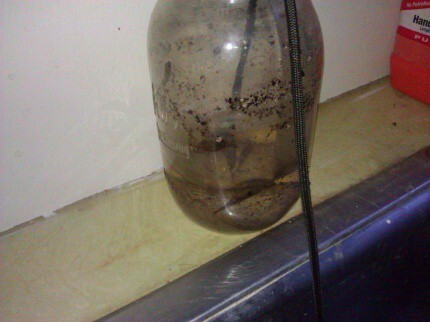 Water will begin to move from the dirty water into the clean container almost immediately. To process a quart of water using paracord, this took about 30 minutes. This method is for filtering water that has collected in a mud-puddle of similar location. It will not remove pathogens, bacteria, chemicals, or other nasty micro organisms found in contaminated water, but I have used this in the field with good results. Also, remember if you are going to consume questionable water, you will need to be rescued within three days. After that, the results of ingesting bad water will begin to affect you health in a very bad way depending on the contaminants. Unlike commercial filters, there are no studies to declare this filter system is good for 200 or 1,000 gallons. So, use common sense with this. Try this at home and see just how simple this method really is. There just might be hope….. Seems to me that this would work well before disinfecting H2O with chemicals like iodine. Take out all the guck beforehand, making the water far more palatable. Would this work on seawater? With seawater, the salt is dissolved in the water, so it will continue to be saltwater and undrinkable. This method removes solids, such as dirt from the water. Smaller or dissolved contaminants would remain. As noted in the post, viral and biological contaminants can pass through. Just because it is clearer doesn’t mean it should be safe to drink. I think doing this before using other filtration methods could extend the life of filters, depending on the contaminants in the water. But, given a choice, I will still run through filters after using this method for as long as I have them available. If you have lots of water to clear up, use multiple lines to increase the volume per hour, then boil and filter before drinking. This is a great idea. I have seen a lot of methods for cleaning the water, but this seems as though it would be one of the best, and fastest ways to go about cleaning dirty water. And although after running water through this water filter like method, it wouldn’t be safe to drink, but simply boil it for 10 minutes after this process, and you would be good to go. I like this. Absent filter paper as a quicker way to separate dissolved particulates, this technique would be a neat way to prepare clean water for subsequent filtration with a water filter such as the Katadyn. The principle is the same as chromatography. I would expect fractions of the dissolved solids to be present on the string. A simple experiment using the same principles may be found at: http://www.scienceprojectlab.com/paper-chromatography-experiment.html. No need to buy that 2 ounce Sawyer MINI that filters 100,000 gallons and removes 99.99999% of the stuff that makes you sick. you don’t have to boil water for ten minutes; just bring it to a boil and that’s it. I do this with old motor oil as well. Don’t put it back in the car, but with a little prep it’ll work well in other motors using oil. In a survival situation I wouldn’t hesitate to re-use it in an older car motor ESPECIALLY if I could mix it with new oil. I know, I know there is still some contaminants passed on, but try it and you’ll be surprised.